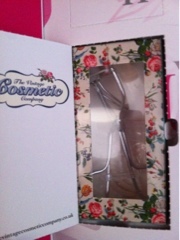 The Vintage Cosmetic Company Eyelash Curlers! wow amazing, sadly I missed out on the You beauty calendar, that and no one bought it for me haha but maybe next year hey! Can't wait to see what else you get! I keep meaning to check out The Vintage Cosmetic Company as I've heard some lovely things about their stuff and it is also really pretty, who doesn't love a little floral!? P.S Nice to chat on #lbloggers!